Is America’s President More King or Duke? NEW YORK — Today’s Dr. Martin Luther King, Jr. national holiday is the perfect occasion to ask: Is President Donald J. Trump more like Dr. King or more akin to former Ku Klux Klan Grand Wizard David Duke? The answer from the media/Democrat/Left (excuse the redundancy) is crystal clear: Duke! But as much as President Trump’s enemies hurl race cards at him like kung fu ninja throwing stars, his statements and actions place him far closer to King and far away from Duke. Consider these King-worthy highlights from Trump’s presidential record, of which the Left hopes Americans will remain largely unaware. 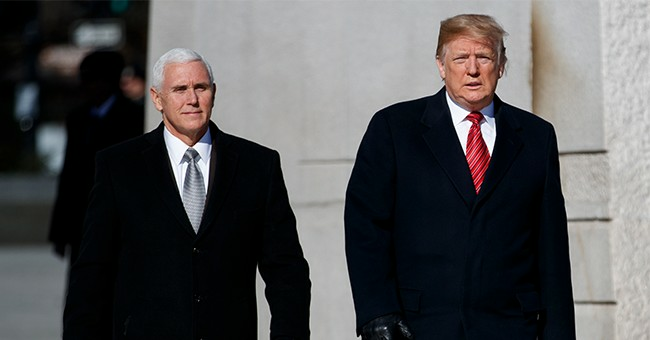 • Just this morning, President Trump and Vice President Mike Pence laid a wreath at Dr. King’s memorial in Washington, D.C. The Trump-hating media already are whining like stuck pigs that Trump and Pence stayed for only two minutes. But how long does it take to lay a wreath? And if they had remained longer, the chorus of complaint would have slammed the winners of the 2016 election for keeping regular visitors away while they hogged the venue in their security bubble. Trump easily could have done other things today than honor King. President David Duke surely would not have made the trip. President Duke’s hand would fall off before he would sign such a document. • On Saturday, President Trump hosted what seems to be the very first naturalization ceremony ever held in the Oval Office. The allegedly “anti-immigrant, racist strongman” welcomed these freshly minted citizens, not from Austria, Germany, and Norway but from Bolivia, Iraq, Jamaica, South Korea, and the United Kingdom. • Moments later, President Trump offered Democrats a perfectly reasonable compromise designed to end the partial government shutdown: a combination of border security, humanitarian assistance, and legal relief for the DACA and TSP immigrant populations. This new law disproportionately benefits black inmates who have endured the very same mass incarceration that Black Lives Matter and similar groups have decried. Obama had eight years to enact criminal-justice reform, but he couldn’t be bothered. He had other priorities than helping black Americans, and others, this way. Instead, he bailed out Iran’s terror regime by air freighting the ayatollahs millions of dollars in laundered cash and unfreezing billions more in financial assets. Obama never signed the First Step Act. David Duke never would have. President Trump did. • Trump has declared this National School Choice Week. His and his administration’s commitment to breaking the Democrat/left/union lock on ghetto and barrio schools offers serious hope to black and brown students trapped on campuses that tragically cultivate ignorance. Specifically, Trump said, “The number of students receiving a D.C. Opportunity Scholarship has increased by nearly 50 percent under my Administration.” This huge increase in D.C. voucher recipients is a 180-degree departure from Obama’s approach. His shameful, toxic hostility to this escape hatch for some of America’s most ill-served minority students (60 percent black, 20 percent Hispanic) included early and relentless efforts to defund and shutter this program. Trump also signed the legislation, sponsored by Senator Ted Cruz (R – Texas) that now lets “529” college-savings plans cover primary – and secondary – school tuition, thus further expanding educational options for minority and other students. • President Trump’s signature Tax Cuts and Jobs Act authorized some 9,000 communities to become Opportunity Zones. These low-income areas now will offer tax incentives, thus boosting prospects for employment and growth in areas that previously offered little. This will be great for Americans, not least blacks and Hispanics who populate these neighborhoods. “Charlottesville!” the media/Democrat/Left will scream in reply. “All Mexicans are rapists!” they will misquote Trump, the facts be damned. No doubt, Trump often should choose his words more carefully and paint with narrower brushes. But there was violence on both sides in the Charlottesville riot, as well as good people for and against removing a controversial statue of Confederate General Robert E. Lee. Gentle, inclusive words like those cited above would have served Trump well when he announced his candidacy, in part noting the genuine problem of illegal aliens who bloody American soil. Deroy Murdock is a Manhattan-based Fox News Contributor, a contributing editor with National Review Online, and a senior fellow with the London Center for Policy Research. Michael Malarkey furnished research for this opinion piece.